This, then, in summary, is a collection of Western stories with trees in them for children, experts, scholars, wives of scholars, and scholars who are poets. I hope there are others also who don’t mind trees. This is Maclean’s first book, published when he was already an old man. It includes three pieces I have a little trouble categorizing. Short stories? Well, they’re not particularly short, not consistently: the first one is over 100 pages and therefore more properly a novella; the second is 20 pages; the third, 90. They are also nonfiction, which makes calling them short stories or novellas also problematic. Take that as you will. They are very fine, whatever they are. I am going to write this review much like I did yesterday’s, heavy on the quotations because this writer is such a Writer. In our family, there was no clear line between religion and fly fishing. We lived at the junction of great trout rivers in western Montana, and our father was a Presbyterian minister and a fly fisherman who tied his own flies and taught others. He told us about Christ’s disciples being fishermen, and we were left to assume, as my brother and I did, that all first-class fishermen on the Sea of Galilee were fly fishermen and that John, the favorite, was a dry-fly fisherman. We meet a young Norman and his brother Paul, briefly as boys to establish their personalities and their relationship with fishing (every bit as reverent as those opening lines suggest), and then we delve into their lives in their early thirties. They fish together. Paul is a gifted fly fisherman. They have a noncommunicative (stereotypically male) relationship, but they worship together at the river, hone their craft, share special moments; their world is intruded upon by the unpleasantness of Norman’s brother-in-law, who is (gasp) a bait fisherman. Paul also likes to fight, and he comes to a young and violent end. All these years later, the Maclean who writes this story might be seen as exorcising a youthful trauma; lucky for us it is as thoughtful, wise, delicate, and beautiful as it is. …I could never be talked into believing that all a fish knows is hunger and fear. I have tried to feel nothing but hunger and fear and don’t see how a fish could ever grow to six inches if that were all he ever felt. In fact, I go so far sometimes as to imagine that a fish thinks pretty thoughts. Again I see Derrick Jensen here: fish are people, too. What a beautiful world it was once. At least a river of it was. And it was almost mine and my family’s, and just a few others’ who wouldn’t steal beer. You could leave beer to cool in the river, and it would be so cold when you got back it wouldn’t foam much. It would be a beer made in the next town if the town were ten thousand or over. So it was either Kessler Beer made in Helena or Highlander Beer made in Missoula that was left to cool in the Blackfoot River. What a wonderful world it was once when all the beer was not made in Milwaukee, Minneapolis, or St. Louis. If you don’t see Hemingway’s legacy there, I don’t know what I can say to help you. Maclean was born just three years after Papa, but Hemingway had been dead over a decade when this, Maclean’s first book, was published, so at least in literary terms they are a generation apart. No one can write prayerfully about fishing and the beauty of a trout stream without channeling that man. I sat there and forgot and forgot, until what remained was the river that went by and I who watched. On the river the heat mirages danced with each other and then they danced through each other and then they joined hands and danced around each other. Eventually the watcher joined the river, and there was only one of us. I believe it was the river. Again, talk about prayerful – a word he uses several times, actually, and appropriately. I won’t quote the famous final line of this story for you. Go find it out for yourself. 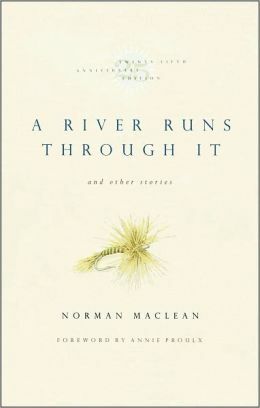 I cannot argue with the accepted notion that “A River Runs Through It” is Maclean’s masterpiece. Next is “Logging and Pimping and ‘Your Pal, Jim'”, a story of Maclean’s work as a young man on a logging camp, during the summers while he’s not in school becoming an academic. The man who signs his letters as in the story’s title is a mystery, and the fact that Maclean leaves him unexplained felt a little strange but, of course, very real. It’s an entertaining and rather disturbing little tale, worth the time, but nothing compared to River. We were fairly representative of early Forest Service crews as I came to know them – maybe not even that good, because the war had ended less than a year before and many of the best men had not yet returned to the woods, and the earth was still pretty much in the care of the old with corrugated skin and tiny steps and young punks looking for a fight and gassed Canadians and anonymous lookouts who had to be there but can’t be remembered. Not one had ever seen the inside or the outside of a school of forestry. But, as Bill said, we were a pretty good crew and we did what we had to do and loved the woods without thinking we owned them, and each of us liked to do at least one thing especially well – liked to swing a jackhammer and feel the earth overpowered by dynamite, liked to fight, liked to heal the injuries of horses, liked to handle groceries and tools and tie knots. And nearly all of us liked to work. When you think about it, that’s a lot to say about a bunch of men. I was young and I thought I was tough and I knew it was beautiful and I was a little bit crazy but hadn’t noticed it yet. …the mountains of Idaho, poems of geology stretching beyond any boundaries and seemingly even beyond the world. The unpacking was just as beautiful – one wet satin back after another without saddle or saddle sore, and not a spot of white wet flesh where hair and hide had rubbed off. Perhaps one has to know something about keeping packs balanced on the backs of animals to think this beautiful, or to notice it at all, but to all those who work come moments of beauty unseen by the rest of the world. I am reeling from this book. Especially having read A River Runs Through It back-to-back with The Solace of Open Spaces, and with the two set side-by-side (or, top to bottom) in Wyoming and Montana, I feel swept away. Sometimes our reading happens this way, that a set of books come together to effect more than the sum of the parts. So, like Ehrlich’s lesser-known work, I will say that Maclean’s is… wise, compassionate, lyrical, and so important and beautiful in its honoring of a dying version of our world. Highly recommended. Rating: 9 beads of sweat.